Northern Lapwing is an elegant bird. Highly migratory, this species is common throughout temperate regions of Eurasia. Adult male in breeding plumage has glossy green upperparts, including wing coverts and tertials. Scapulars show purple sheen. Primary flight feathers are buffy-white tipped. Rump is chestnut. Uppertail is white with broad subterminal black band and narrow white terminal line. Outer rectrices are entirely white. Underparts are white, except for black chin, throat and breast. Undertail coverts are chestnut. Underwing coverts are white, except for median and greater primary coverts which are black, as the flight feathers. Wings are long and broad. On the head, breeding male has black forehead, crown and crest. Face may be white with blackish markings around the eyes, on cheeks and ear-coverts. Rear crown and nape are tinged chestnut. The straight bill is blackish. Eyes are dark brown. Legs and feet are pinkish. In non-breeding plumage, adult male has tipped-buff mantle and coverts feathers. On the head, face becomes pale buff with black patch below the eye. Chin, throat and upper breast are white, while the broad black collar is reduced. Adult female in breeding plumage has less conspicuously marked head than male, and she has shorter crest. She is similar to male in non breeding plumage. Juvenile is duller than non breeding adults, and has shorter crest. On the upperparts, feathers are conspicuously edged buff. 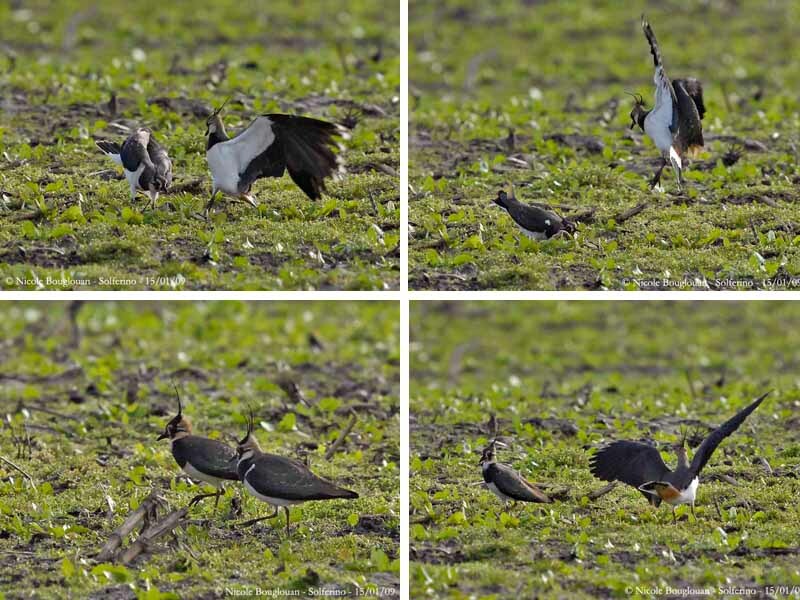 Northern Lapwing utters thin, plaintive calls in flight, or if excited when in flocks foraging on the ground. The call “wee-ip” includes a variety of pitches. Territorial song “coo-wee-ip” or “wee-willuch-coo-wee-ip” is given in flight. The songs uttered during behavioural displays are mainly given in the early morning and throughout the day and the night during the breeding season if the weather is nice. The song phrases follow each step of the flight, except when the male rolls from side to side, during which it performs droning sounds with the wing tips. 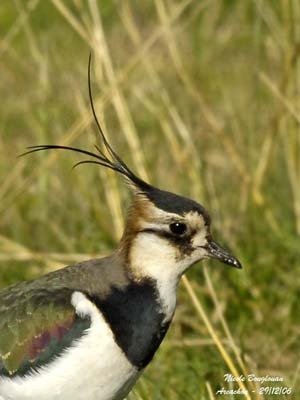 Northern Lapwing breeds in a wide variety of open habitats, usually with bare ground or low vegetation. It is also found in wetlands, marshes, heaths, cultivated fields and meadows. Outside the breeding season, it is often seen in harvested fields, and roosts in old pastures. 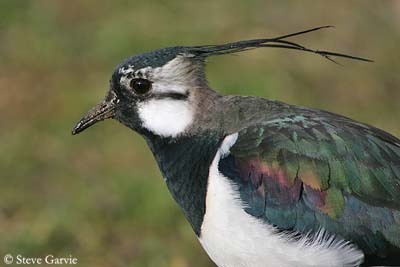 Northern Lapwing is common in temperate Eurasia. This species is highly migratory and winters southwards, as far as North Africa, northern India and China. The birds of the westernmost parts of Europe may be resident. 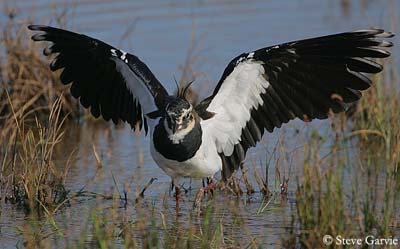 Northern Lapwing is occasionally seen in North America after storms. 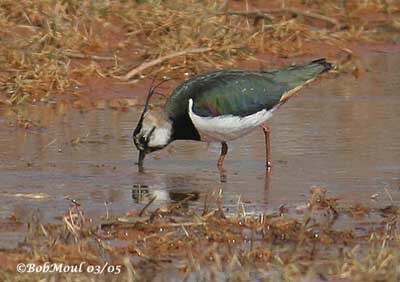 Northern Lapwing feeds mainly on wide variety of invertebrates. It may feed in mixed flocks with other plovers and Laridae. 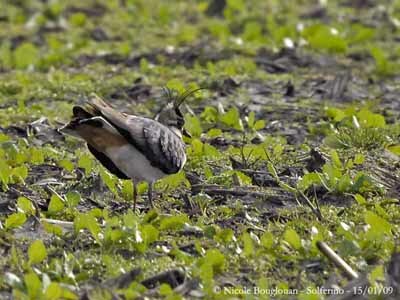 This bird feeds sometimes by ‘foot-trembling” as numerous waders’ species, in order to disturb the invertebrates hidden into the soil. It may feed as well by day as by night, especially on bright moonlight nights. 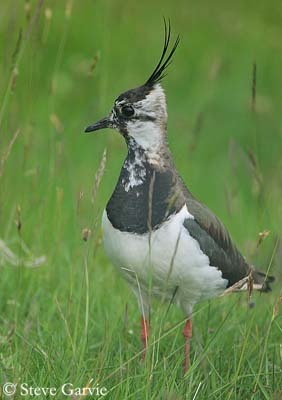 Northern Lapwing is heavily migratory in most parts of the range. This species migrates by day in large flocks. 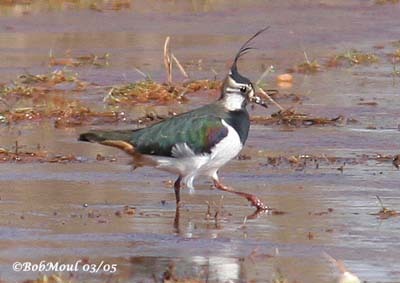 Northern Lapwing performs several displays according to the period. It performs song flights during disputes between males, in order to establish the territory. However, physical contact is rare. Once the territory is established, it remains within it, chasing away the intruders and guarding its mate. Male performs spectacular song flight displays with steep ascents and vertical dives. It also performs the “alternating flight” during which the male rolls from side to side. At this moment, we can hear a droning sound produced by the wing tips. 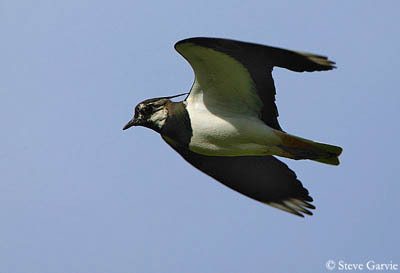 Outside the flight displays, Northern Lapwing performs an irregular and slow progression in flight, due to the large and broad wings. 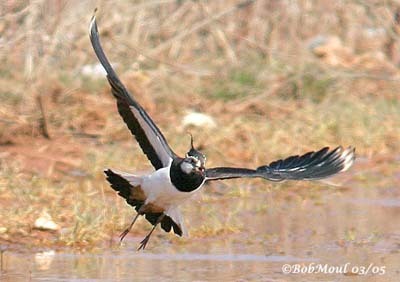 Northern Lapwing is monogamous for one season, and may be polygamous sometimes. The laying occurs from late March to early June. Very territorial, this species is usually solitary nester. The nest is situated in short grassy area. It is a shallow scrape lined with vegetation such as grass stems and leaves. Female lays 4 brown eggs with black markings. Incubation by both parents lasts about 21 to 28 days, and starts when the last egg is laid. Chicks are covered in pale brown down streaked and blotched black, and have white nape. Female broods them but they are fed and tended by both adults. Young reach the sexual maturity at one year. 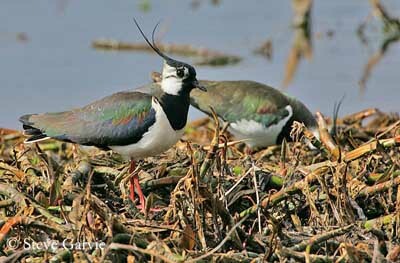 Northern lapwing feeds on invertebrates such as earth worms and insects. It also consumes beetles (larvae and adults), ants, flies, moths, crickets, and also spiders and snails. They usually feed in cultivated areas and both during day and night. 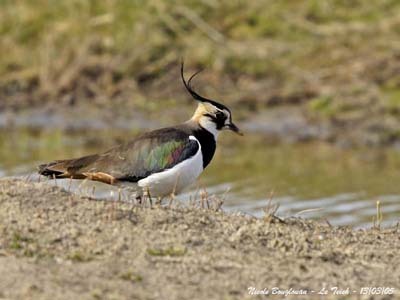 Northern Lapwing suffered past declines due to changes in the habitat such as wetland drainage. Today, intensification and changes in agricultural practices involve reduced breeding productivity. The oil pollution threatens several stopovers habitats on the Baltic Sea coast line. The nests suffer predation by introduced mammals and raptors. Hunting and egg collecting also play an important role in these declines. However, populations are not threatened at this moment.